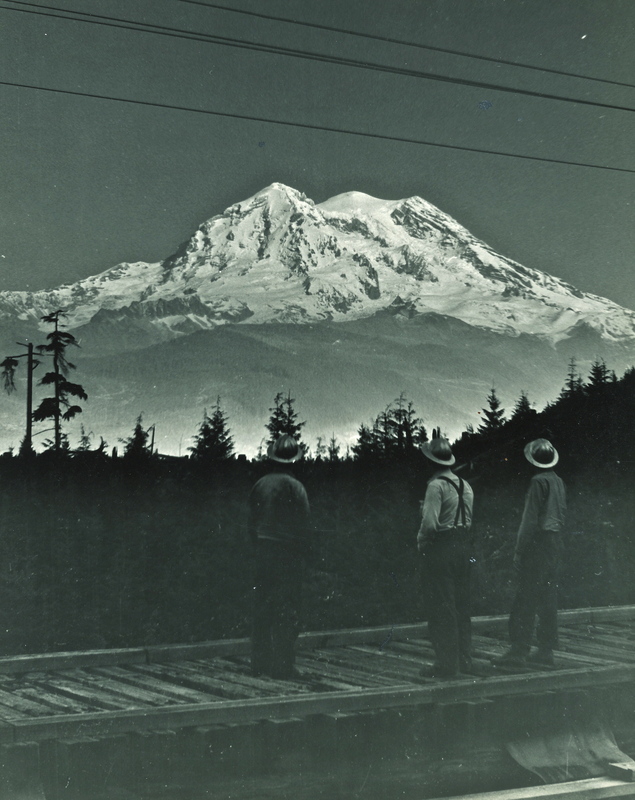 These loggers are taking a break to appreciate Mount Rainier. Sometimes you just have to. It takes your breath away — even for locals. If you’d like to see a cool video of snow being cleared off Stevens Canyon Rd. at Reflection Lakes, just click HERE. Photo courtesy of Linda Lewis. A plane crashed near Mt. 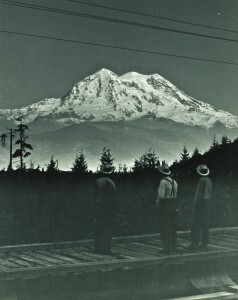 Rainier and some loggers turned the engine from the crashed plane into a snowmobile. Do you by chance have any information on that crash or old photos? Really?! I hadn’t heard about that? Do you know who created the snowmobile. I have lots of information on the crash, but what year? Thank you for the reply. We have the actual snowmobile that was created using parts from the plane crash. The snowmobile was part of an exhibit at the former (long since closed) Camp 6 Logging Museum in Tacoma. When Camp 6 closed an agreement was made to transfer some of the artifacts to the railroad and logging museum in Elbe and Mineral. The snowmobile is on site in Mineral now though it’s behind the scenes awaiting restoration. Later this fall a group of volunteers will begin to restore the snowmobile and build a new exhibit. Would love to connect with you to get more information on that plane crash. The museum will be closed on Mondays and Tuesdays. It would be best for you to connect with Steven Butler the Assistant General Manager. Steven’s contact information is published on the “Contact Us” button. The museum could benefit from your information on the plane crash. The museum will need to create a panel to tell the story of the artifact and the plane crash info would factor into the panel. That sounds great. I will be getting on touch with Steven here in the next few days! !